Is this their first pic together since coming back? As in, newspapers. Either way, this image calms my heart. It just feels right. And what too? No matter what, KAT-TUN really is a super idol group... them coming back was like THE BIG news from JCD. So big that even people who aren't fans, know of their return. I love one (1) group. So happy too upon hearing the big /great news. 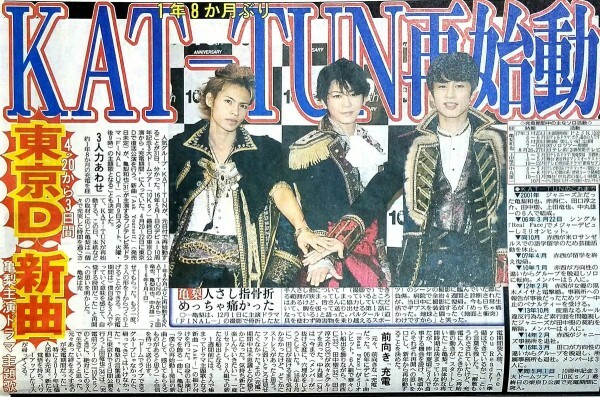 Okaeri KAT- TUN. Goodluck. Good luck to the fandom, indeed. They are big! I remember the reaction of the public when the announcers screamed "KAT-TUN" in JCD. It was like the Dome erupted in happiness and I'm sure there were many who aren't actively KT fans, but that were happy that they were back and for us Hyphens! Just waiting for the single or album announcement and for them to start showing up together again in TV shows and magazines! I have no complaints being bombarded with gorgeous Kame (and dear Lord what's up with him looking even more gorgeous than usual? ), but... *looks sideways at Johnnys* whats with the silence after that explosive announcement and performance? It's the third year that I watch the JCD on streaming while cooking, lolol. But for those who were at the Dome... now THAT must have been special for the Hyphens who were there! If my heart raced like crazy and skipped beats when I heard their name and heard the beginning of Real Face... Can't imagine if I had been really there! Still I won't soon forget that performance! You know, just today I was sitting down scanning through twitter and it hit me, 'oh, there hasn't been any group activity since the announcement. hmmm... I wonder what they're up to'. I did... and still do find only a 3 days concert weird... and only once per day. I mean, it's a comeback concert so at least more days or the usual, twice a day more so since it's a weekend... maybe they're working on another project... well I do hope so! I do wonder about the 3 days only cons and just 1 con a day too. Been thinking if they are waiting to see how many applications they receive to book a few more days/or a second concert on those days. I mean they did add an extra for 10Ks, so... al is just suppositions and ifs. Guess we'll have to wait for the balloting results. this picture must be from the countdown...I think they're wearing that outfit right!? This pic is from 10KS. Well, soon you'll have plenty of group releases to indulge in!